The new buyers of the hillside Tiburon home learned that due to the Town of Tiburon planning codes, the existing home exceeded the new FAR restrictions based on their lot size. The owners did not want to downsize so it was decided to invest $2 million to remodel the existing structure and preserve the floor area. The existing 4,400 sf, two-story home sits on a site possessing magnificent wrap-around views of the bay, the City of San Francisco, the Golden Gate Bridge and Angel Island. The client expressed a desire to "freshen up" the existing 1980's aesthetic as well as update the building systems with a strong environmental conscience in mind. Sophisticated "smart home" features were installed to control the energy use of the home on-site as well as remotely as they were frequently abroad for extended periods of time. Solar panels were placed on the roof and a rainwater harvesting system to supply the landscape irrigation needs was installed on new terraced concrete platforms on the hillside below the house. All of the windows were replaced with new energy efficient designs, energy efficient lighting and higher efficiency insulation was installed throughout. 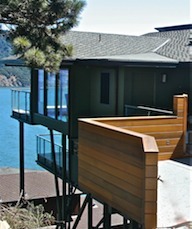 Due to the extent of the remodel, the structure had to be updated and the cantilevered decks had to be further reinforced with new steel posts and beams. Glass railings replaced the existing wood to open up the views from seated positions in the Living Room and a new Front Entry was designed.